The popular romances of medieval England are fantasy stories of love at first sight; brave knights seeking adventure; evil stewards; passionate, lusty women; hand-to-hand combat; angry dragons; and miracles. They are not only fun but indicate a great deal about the ideals and values of the society they were written in. Yet the genre of Middle English romance has only recently begun to attain critical respectability, dismissed as “vayn carpynge” in its own age and generally treated by twentieth-century critics as a junk-food form of medieval literature. Chaucer’s Tale of Sir Thopas has been assumed to be a satire of the romances’ clichéd formulas and unskilled authors. But the romances evidently enjoyed popularity among all English classes, and the genre itself continued to flourish and evolve down to present-day novels and movies. Whatever Chaucer and his contemporaries thought of romances, they would have needed some personal familiarity with the stories and texts for comic tales such as Sir Thopas to be understood. A century ago, Beowulf faced the same problem that the Middle English romances still face: no modern translations were published because few had heard of the poem– because there were no modern translations published. Where the romances have been printed, they have normally been reproduced as critical editions in their original language, or translated into heavily abridged children’s versions, but few have been published as scholarly close line translations with notes. 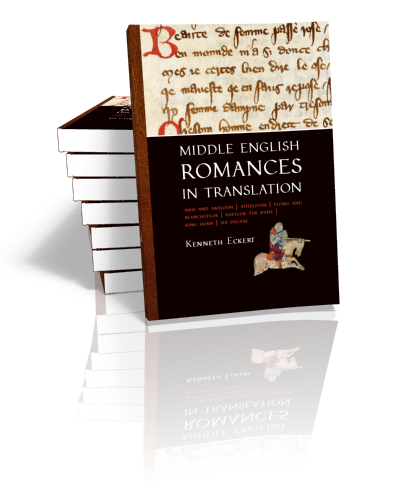 This book is an attempt to remedy this by making some of these romances available to the student or lay reader who lacks specialized knowledge of Middle English, with the hope that a clearer understanding of the poems will encourage not only enjoyment but also further study. After centuries of being dismissed “a wit-besotting trash of books” written by “literary hacks”, the Middle English romances have only recently been recognized as intelligent and evocative texts helping to illuminate medieval insular culture. This book hopes to further such a dialogue with six romances representative of different themes and origins. 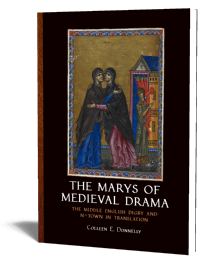 Each chapter is a facing translation, featuring the original Middle English text on the left of the page and an academic close-line translation into Present Day English on the right, accompanied by explanatory notes and sources. A saintly ‘bro-mance’ about two knights who pledge faith to each other, a loyalty tested when one is caught in a lie after being seduced by the king’s daughter and the other must break his word to save his friend’s life—a decision followed by heavenly punishment and a miracle of mercy. A darker romance from the troubled time of Richard II about a capricious, gullible king who believes an accusation of treason against his blood-brother made by a jealous competitor, a murderous situation only faced by the archbishop’s miraculous tests and a hard-working messenger. Here appearing for the first time in full with a missing introduction supplied from an earlier French version, a light and entertaining “roman rose” about a boy of a Muslim king who falls in love with his Saxon playmate and travels to Arabia to rescue her from the Emir’s marriage plans. A dramatic ‘male Cinderella’ romance where Havelok, prince of Denmark, is rescued as a boy from an usurper’s plans for murder by a fisherman and brought to England, where he grows up to marry the dispossessed princess, brings revenge to both nations, and regains the throne. A seafaring romance where prince Horn is exiled by invading Saracens and sails to a new land where King Murray raises him, complicated when he is accused of deflowering the princess and banished to Ireland; after avenging his father he returns to settle scores and rescue his lady. Possibly from a Breton lay, a mysterious tale of a princess raped by a handsome fairy who sends away her baby to be raised by priests; after proving himself as a knight, Degare unwittingly marries his mother, but when the error is recognized he seeks out glory and his father. 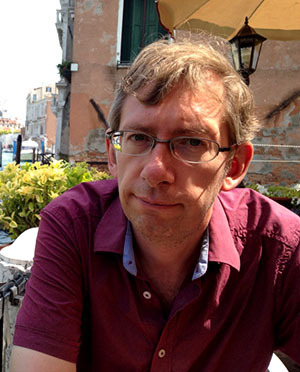 Dr. Ken Eckert is Assistant Professor of English at Hanyang University (ERICA), Ansan, Korea, where he teaches undergraduate courses in English literature and graduate-level composition theory. He studied at the University of Nevada, Las Vegas (PhD, 2011), with a dissertation in Chaucer and medieval romance; Memorial University of Newfoundland (MA, 2001), with a thesis and translation of Beowulf; and Concordia University of Edmonton (BA, 1990).